We decided to do something different this year and keep Thanksgiving low key. It has been a busy month and what I want most is to spend time together as a family instead of being alone in the kitchen all day. 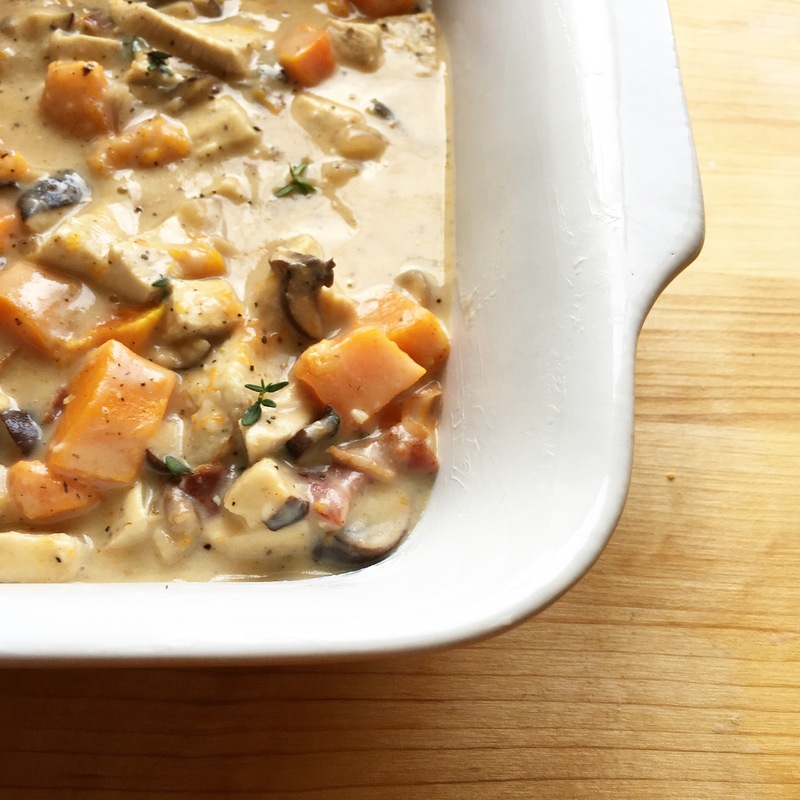 My favorite part of Thanksgiving food is all of the fantastic things you get to make with leftovers, turkey and brie panini, turkey and wild rice soup, this Turkey Pot Pie with Bacon and Wild Mushrooms. It’s all so much more exciting to me than the roasted turkey itself. After talking to our guests we discovered that they all felt the same way so this year we decided to skip straight to it and have turkey pot pie Thanksgiving day. I am cooking a turkey breast the day before so I can easily get dinner in the oven during the kids nap and still have time to get ready for our guest. That leaves the whole morning open for pie baking, ornament making, lego village building, and relaxing as much as possible with 2 under 2. 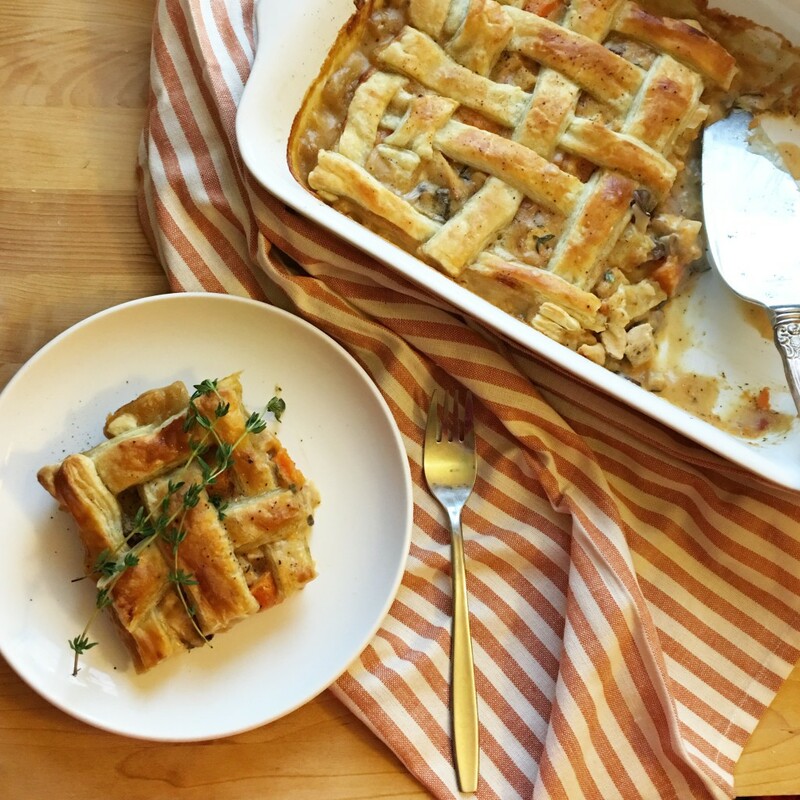 Now let me tell you about this pot pie, this amazing use of Thanksgiving leftovers so good it once turned a vegetarian for the day (yes, it really did, she had seconds). 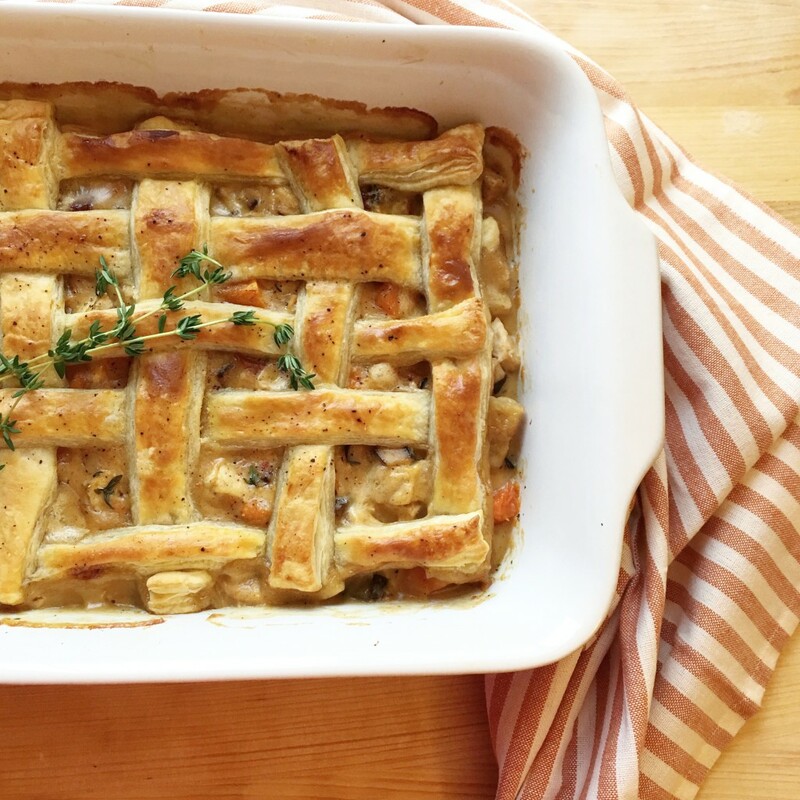 Turkey, bacon, and wild mushrooms in a rich creamy sauce topped with flaky, buttery puff pastry. It’s such an easy comforting meal. I’m sure I will do full Thanksgiving dinners again in the future but right now, this year, I feel like this is the kind of relaxed stress free Holiday our family needs. 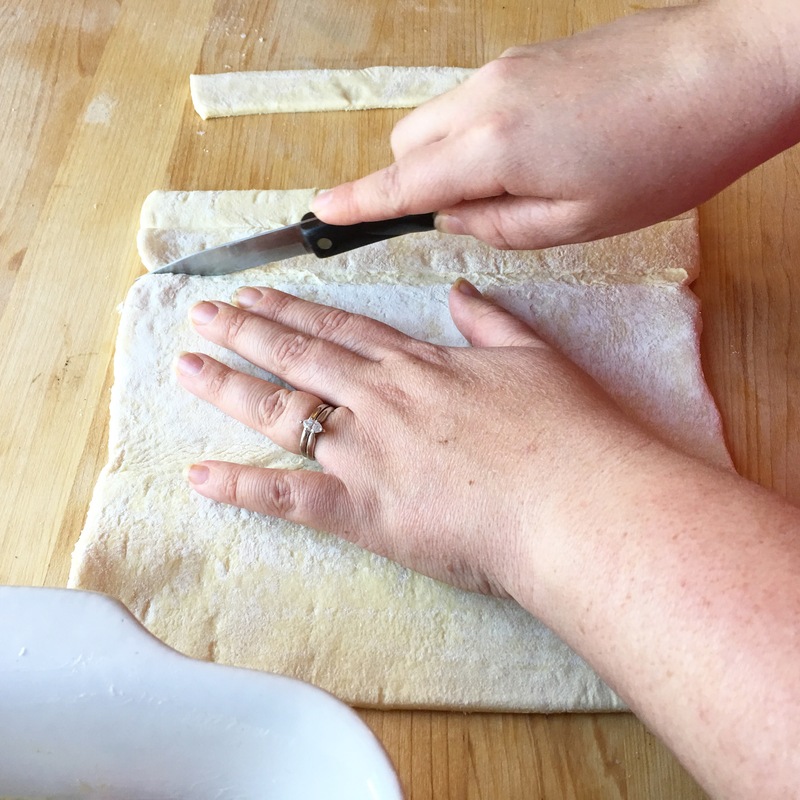 Allow puff pastry to soften according to package instructions. In a large skillet over medium heat cook bacon until brown and crispy, about 8 minutes. Put the bacon and any cooking juices onto a paper towel-lined pate. Add a little oil, shallots, mushrooms, Fresno pepper and Thyme to the same skillet you cooked the bacon in. Sauté until the shallots are soft and fragrant. Remove from the pan and set aside. You can toss the Fresno pepper at this point. In the same skillet melt the butter, stir in the flour and cook until golden brown. Add chicken broth to the pan, stirring constantly until the mixture thickens. 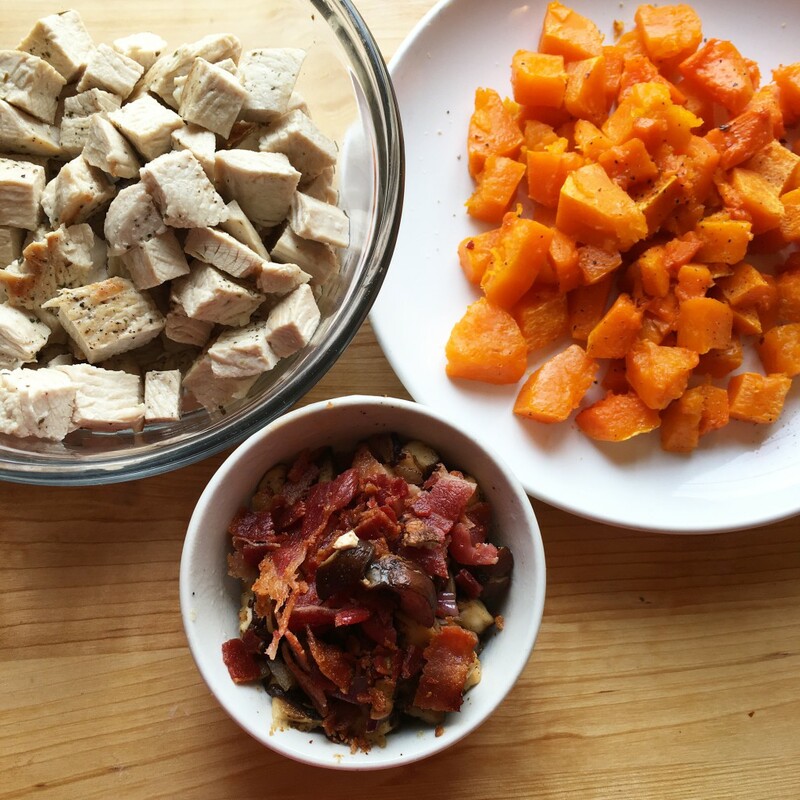 Add the heavy cream, bacon, mushroom mixture, butternut squash, and turkey. Season with salt and pepper. Simmer until heated through, about three minutes. 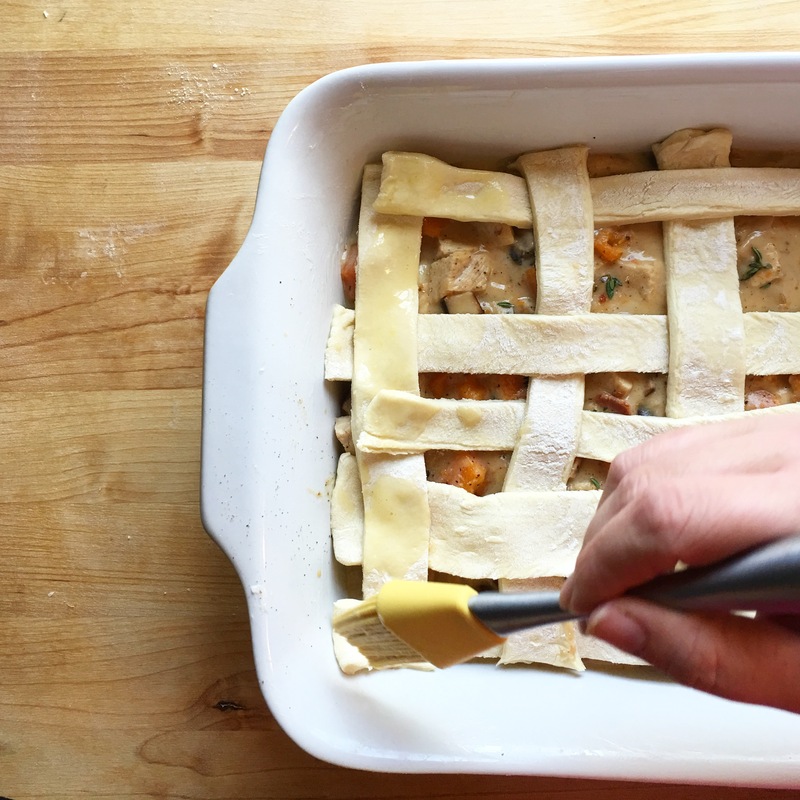 Pour filling into a 9 by 9 baking dish or pie pan. Top with puff pastry. You can place the whole sheet on top or cut it into strips and make a lattice pattern across the top as I did. *The Fresno pepper is optional but it balances the sweetness of the roasted squash. I sauté a halved on in with the vegetables and then remove it so you get a subtle warmth, it will not make the dish spicy.